MR measurements can be made sensitive to the diffusion-related motion of water molecules in living tissue. This plays a key role in clinical diagnostics of stroke: the stroke area can be detected earlier than with conventional methods. This provides early information for decisions on the initiation of thrombolytic therapy. The method is thought to rely on the phenomenon that the cells start swelling within minutes after disruption of blood supply. Diffusion Tensor Imaging (DTI) measures the diffusion coefficient's dependence on the direction of motion considered (anisotropy). It can be used to visualize the orientation of fibre bundles in the brain because water molecules in tissue move faster along the fibre direction. The degree of diffusion anisotropy depends on the thickness of the axonal myelin sheath, which can be impaired in multiple sclerosis or motor neuron disease, e.g. In fibre bundle crossings, DTI cannot resolve the fibre directions but can be replaced by more sophisticated methods such as 3D q-space imaging. A DTI-based fibre orientation map shows the main fibre orientation in every volume element of approx. 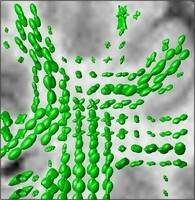 3 mm size, visualizing the prominent fibre bundles connecting different parts of the cortex. An automatic reconstruction of complete bundle pathways (fibre tracking) can be designed in many different ways, producing maps of major connections in the brain. The project aims at improving and applying MRI-based strategies to assess the network of anatomical connections in the human brain. Left: Probabilistic DTI-based fibre tracking. Here, a Monte Carlo algorithm was used to visualize the main bundles originating from the position marked by the arrow. Right: In fibre bundle crossings, the value of DTI is limited. In a volume containing three orthogonal bundles in equal shares, the diffusion tensor merely reflects isotropic diffusion. One solution is to measure the "displacement probability density function" (DPDF) by 3D q-space imaging, indicating the probability of molecular motion in the directions of space within a given time. 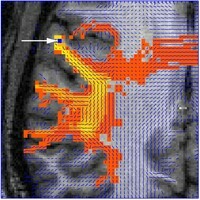 Here, DPDF isosurfaces in a coronal brain section are shown (green, angle dependence exaggerated, overlaid with corresponding T1-weighted MR image). The section contains the crossing region between corticospinal tract, superior longitudinal fascicle, and callosal fibres.